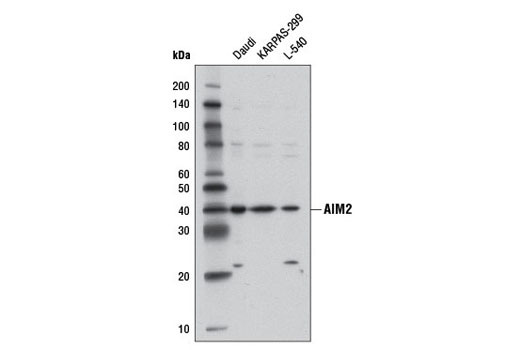 Western blot analysis of extracts from Daudi, KARPAS-299, and L-540 cell lines using AIM2 (D5X7K) Rabbit mAb. Western blot analysis of extracts from HL-60 cells, serum-starved and either untreated (-) or treated overnight with Human Interferon-γ (hIFN-γ) #8901 (100 ng/ml; +), using AIM2 (D5X7K) Rabbit mAb (upper) or β-Actin (D6A8) Rabbit mAb #8457 (lower). 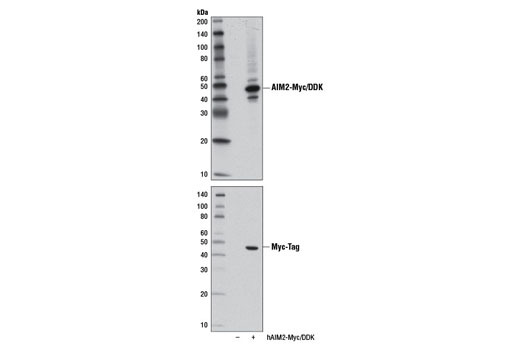 Western blot analysis of extracts from 293T cells, mock transfected (-) or transfected with a construct expressing Myc-DDK tagged human AIM2 (hAIM2-Myc/DDK; +), using AIM2 (D5X7K) Rabbit mAb (upper) and Myc-Tag (71D10) Rabbit mAb #2278 (lower). Immunoprecipitation of AIM2 from HL-60 cell extracts treated with Human Interferon-γ (hIFN-γ) #8901 (100 ng/ml, overnight) using Rabbit (DA1E) mAb IgG XP® Isotype Control #3900 (lane 2) or AIM2 (D5X7K) Rabbit mAb (lane 3). Lane 1 is 10% input. 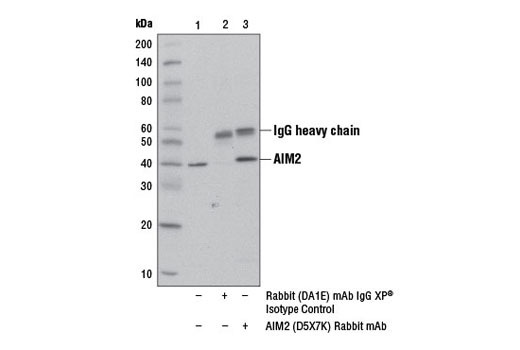 Western blot was performed using AIM2 (D5X7K) Rabbit mAb. 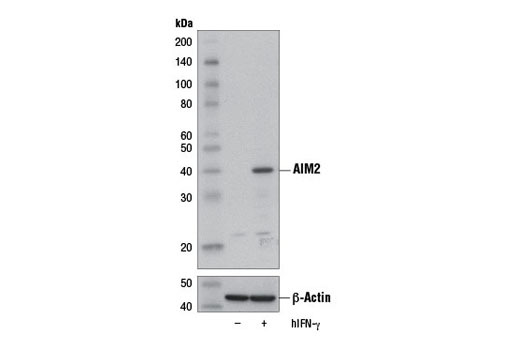 AIM2 (D5X7K) Rabbit mAb recognizes endogenous levels of total AIM2 protein. An unknown band is detected at 22 kDa in some cell lines. Monoclonal antibody is produced by immunizing animals with a synthetic peptide corresponding to residues surrounding Lys93 of human AIM2 protein.